If There Were 34 Hours in the Day, You Would be Saved. Between running your IT department, dealing with open issues, handling the system upgrade implementations, taking care of the day-to-day tasks, organizing and delegating, there’s really very little time to do anything else. Unfortunately there’s always more to do. You still need to continually vet the marketplace as you grow and change your technology configurations to match your needs. You need to redline and negotiate contracts, ensure you are getting the true low market price for IT services, and meet deadlines that are usually too fast with budgets that are usually too small. On one side, you don’t have the time to fulfill all your responsibilities to the best of your ability. On the other side, you don’t have the time to pay the proper attention to contract negotiations, vendor analysis, comparison and selection, which can cause you to pay up to 300% more than you should for services that you may not even need. If this sounds familiar, there is a solution for you - the IT services broker model. Time savings - working with someone who knows the marketplace and the key players at each service provider will save valuable time when sourcing complex IT infrastructure services. Cost savings - a broker should know low pricing benchmarks for each service and geographical location, as well be familiar with your business goals in order to optimize your IT spend now and into the future. Advocacy - when purchasing IT services, you want someone on your side to provide market intelligence on the best provider and service solution for your specific business needs. 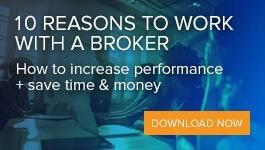 Download the free e-book to see all the advantages to using an IT services broker to stay ahead of the competition.